You don’t need to make radical changes, but by getting started, you can differentiate your brand, and do well by doing good. It seems impossible to believe now, but there was a time not too long ago when diet food products were perceived by manufacturers to be too niche for the mass market. It was the mid 70’s, and calorie concern was seen as a fad. At first, most big companies like Coca Cola and Budweiser tried to ignore it. Then they half-heartedly went after it with brands like Tab and Natural Light. By 1982, both had come to their senses and rolled out diet/light versions of their world famous parents, and the rest is history. Flash forward 30 years, and you have a pretty good picture of the sustainable products landscape. 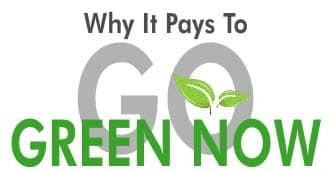 People at every point in the supply chain have heard about green issues, some with outright skepticism, many others with various levels of interest, but with few stepping forward and embracing the change. This is competitive opportunity, the legendary “first mover” designation that comes at the early stage in any movement. The alarm bells will start clanging in 2011. That’s when a rare triple witching hour of coincidental timing will take place. The first occurrence will be the settling down of the world economy we all hope and pray, so that anything else can be heard above the din. The second is a U.S. administration on record as promoting green technology as the future of this country. And the third will be the issuance of 5th Assessment from the IPCC, the body impaneled by the U.N. and the World Meteorological Organization to study all scientific data published on the subject of climate change and issue a policy report for guidance to all member nations. The only problem with these reports is that they have all been wrong in their forecasts… on the low side. And unfortunately, early word is that they are going to be way off the mark again. Everything is accelerating at such a phenomenal pace that it has been difficult to keep up. At the risk of being labeled doomsayers or worse, the reports have hedged, providing a range of relatively conservative forecasts to go along with the most troubling. Apparently, even this approach will not be tenable any longer. The rate of industrialization around the world and the attendant carbon emissions are making that impossible. What this means is that a starting line has been drawn in the sand, and companies are already lining up. By the time the alarm bells start going off, forward-thinking organizations will be well down the road toward sustainability. The most successful of them will not only have products in the pipeline, but will have launched them and begun developing a reputation as the go-to resource. Remember the lowly Prius? For 10 years, it was the ugly duckling of the Toyota line, an odd-looking vehicle driven by tree huggers. But when gas hit $4 a gallon, there were none to be had, and waiting lists grew to 6 months long. Was it because the Prius was really that much better than any other hybrid alternatives? Who knows or cares? What matters is that it had been around the longest and was the most well-known brand. It’s marketing 101. So what does this mean for furniture? Everything. Furniture is the third largest user of wood products, and deforestation accounts for nearly 25% of the carbon problem. But that’s just the beginning. There are numerous issues that take cover under the green umbrella, including indoor air quality, toxic pollutants, and overflowing landfills. Home furnishings are a significant contributor to each and every one. “Natural” finishes like varnish, lacquer and shellac include thinners naturally abundant in Volatile Organic Compounds (VOC’s). The furniture industry also consumes 1/3 of the world’s polyurethane foam production, a petroleum (carbon) product. And furniture accounts for 4% of all landfill waste, much more when you include packaging. So does that mean that you have to go all green, all the time? Far from it. In every retail market, there is a small segment representing about 5% of the buying population that are your dyed-in-the-wool environmental activists. If your goal is to reach these people, then you will need a smattering of products that meet an incredibly stringent standard such as FSC-certified lumber, 100% latex cushioning, or certified organic textiles. The majority of your customers, however, are people who have started taking some positive steps, but have been stymied by the lack of available furniture options where they shop. An easy entry for these folks is bamboo, a rapid renewable that consumes more carbon than a comparable stand of trees. Another is bio hybrid cushioning that combines polyurethane and soy bean molecules to lessen the environmental impact. La Difference, a contemporary retailer in Richmond, VA is doing an excellent job of making that steady transition while maintaining a full array of exciting products for any consumer. They started by sourcing and flooring some eco friendly options. 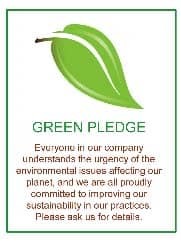 They developed silent sellers that express their commitment throughout the store, and held in-store training sessions for their sales staff facilitated by the Sustainable Furnishings Council to help them better understand the issues and how best to represent green products. They prepared a detailed questionnaire that will be sent to all their vendors to collect information on sustainability efforts. This questionnaire clearly points out that their answers will not be used to preclude purchases from companies that are not currently doing much in this area. Finally, they looked for unique opportunities to promote their position, such as taking a booth at a local Home & Garden Show that had green as a sub-theme. 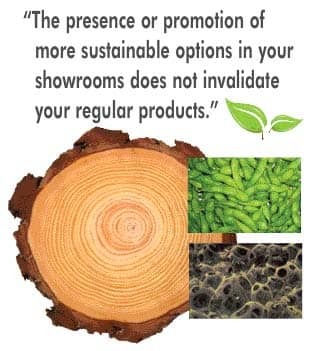 Remember that the presence or promotion of more sustainable options in your showrooms does not invalidate your other, regular products. Consumers did not think any the worse of Coca Cola or Budweiser for introducing more healthful versions, nor will they of you. Instead, they will recognize you as concerned, progressive and on trend. That’s exactly what you want all of your marketing efforts to convey, and this on an increasingly critical issue. 1. Appoint a green team. Designate a leader, encourage participation of at least one member of each functional department, and make it their responsibility to put together a plan and report regularly on progress made. Charge them with keeping up with developments in all aspects of the business, then have them make monthly presentations to management and staff on their findings. The intention is to grow this group into in-house experts. 2. Source green products. At every market, ask every supplier and manufacturer, to show you their green offerings. When companies are asked why they do not make a wider array of sustainable goods, they universally say the same thing…”We will as soon as our customers ask for them.” That means you, people. Read the trade press, do a web search for “sustainable,” “eco friendly,” or “green furniture,” visit dedicated green pavilions at market, and by all means, ask every one of your current vendors. Business is simple. Companies make what others will buy, and they know what you want when you ask them for it. 3. Don’t wait for your customers to ask. Customers don’t ask for innovations, they buy them. If Steve Jobs had waited for people to ask for a better MP3 player, there would be no Ipod. As suppliers, manufacturers, and retailers, it’s part of the job to anticipate buyers’ demands, present them with options, and be ready to fill the orders. Sustainable products are no different. 4. Educate yourself and your staff. Ultimately, you are the authority for your customers when it comes to furniture, just as you are on the difference between 8-way hand-tied vs. sinuous coil suspension, between kiln-dried hardwoods vs. laminates on particle board. This is exactly as it should be. Collect information from web sites such as www.epa.gov, www.nrdc.org, and the SFC’s fact filled website at www.sustainablefurnishings.org. Attend seminars at market, ask questions, and pick up literature. Ask your reps to make dedicated sales presentations on their green options to your staff. Invite local interior designers specializing in green to do the same. Become as knowledgeable on this subject as you are on every other important manufacturing process. 5. Promote your green options. When you have the goods, let people know. Not to the exclusion of everything else, but you should certainly show some on the floor and they should be part of the rotation of regular products that you feature in advertising and promotion. 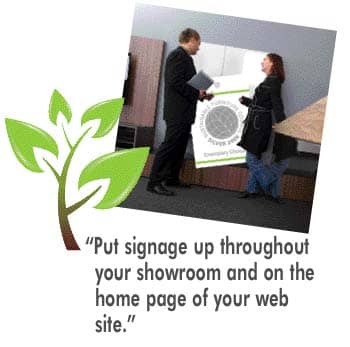 Put signage up throughout your showroom and on the home page of your web site, including a green pledge or mission statement and direction to the options you offer. Stage a green market theme one year, or a green weekend promotion. April 22 is Earth Day, and last time I checked, April was a little thin on promotable holidays anyway. That’s plenty enough to start. Many times with serious problems, people tend to get so daunted by the task at hand that they don’t even begin. The entire U.S. could reduce household electrical usage 20% simply by switching all their light bulbs to CFL’s and unplugging appliances not in use. No matter what you do, do something! FSC-Certified Wood: The Forest Stewardship Council is the highest standard in the world, with a network of accredited National Initiatives doing direct inspections in 45 countries around the world. North American Wood: There are a number of certification bodies in the U.S. and Canada (FSC, SFI, CSA). Just make sure the wood is used in local manufacturing. Recycled Materials: Antiques are the ultimate recycled goods, and numerous companies build rustic furniture with reclaimed lumber. Renewable Species: Fast-growing and/or commercially harvested woods such as Bamboo and Mango are good choices. The furniture industry uses 1/3 of worldwide polyurethane foam production. Polyurethane is petroleum-based and many breakthroughs are being made with hybrids combining polyurethane and other bio-based alternatives. Soy Beans: Early issues with odor and degradation have been overcome, and there are now foams on the market containing 20 to 30% soy content. Life Cycle Assessment: Bio options show a significant reduction in greenhouse gas emissions in manufacturing. It is estimated that every 1 million pounds of polyols converted from petroleum saves 2,200 barrels of oil. Volatile organic compounds (VOC’s) are pollutants found in many finishes that contain petroleum or synthetic –based solvents. VOC’s create harmful working conditions, especially when sprayed. The most problematic is varnish, followed by lacquer and shellac. Water-Based Alternatives: Water-based sealers use fewer harsh solvents for packing or cleaning with VOC’s at 50g/L vs. the EPA limit of 350 to 450. They also dry quickly, reducing exposure to harmful vapors. Wax or Whey-Based Alternatives: Bee’s wax is a safe, traditional finish, and a lot of work is going into whey-based and other organics that avoid solvents. • Setting up recycling program. • Identifying current vendor options. • Screening new vendor alternatives. Jeff Hiller is the newly elected President of the non-profit Sustainable Furnishings Council, the #1 organization in green home furnishings and a leading provider of educational and training programs. A long-time furniture retailer and manufacturer/importer, he now owns PROaction Marketing Group, a marketing and sales consultancy based in Austin, TX. Jeff welcomes questions from FURNITURE WORLD Magazine’s readers at jeff@sustainablefurnishings.org.